In this Sept. 20, 2018, photo, an Uyghur woman uses an electric-powered scooter to fetch school children as they ride past a picture showing China's President Xi Jinping joining hands with a group of Uyghur elders at the Unity New Village in Hotan, in western China's Xinjiang region. From Russia’s meddling in the U.S. 2016 presidential election to China’s “influence operations” in Australia and the United States, it is clear that the manipulation of information in pursuit of political and strategic objectives has become a major dynamic of contemporary international security. Most discussion of contemporary IW operations assumes they are primarily externally-oriented in nature and application. In China’s case, there has been substantial analysis of its deployment of its IW concept of the “three warfares” (san zhong zhanfa) – public opinion, psychological, and legal warfare – with regard to long-standing international conflicts such as Taiwan, the South China Sea, and territorial disputes with India. However, China has also deployed elements of this strategy to counter a primarily domestic security challenge: the perceived threat of Uyghur militancy, radicalization, and terrorism in the Xinjiang Uyghur Autonomous Region (XUAR). Although Beijing’s approach to combating Uyghur opposition has always rested on the capabilities of the security forces, this has been augmented by policies that are consistent with a core objective of China’s IW strategies: to not only deter but ultimately degrade the will and capability of the adversary to initiate or sustain political-military struggle contra the interests of the Chinese Communist Party (CCP). This dynamic is perhaps best reflected in the roll out of China’s “social credit” system, which relies on collecting and analyzing meta-data to shape and “score” individual citizens’ economic and social behavior. The effect fuels both passive participation through the state’s access to personal data linked to everyday conveniences (such as electronic payment systems) and active participation by coercing people into allowing the state to monitor and punish individuals for noncompliance. Human Rights Watch asserts that this is emblematic of a system of “predictive policing,” whereby monitoring an individual’s social interactions, use of social media, and physical movement enables the state to make real-time assessments of their perceived “threat” to it at any time. Since 2014 the Xinjiang regional government has systematically implemented this dystopian vision of digitally-powered totalitarianism in the service of “stability” including: installation of China’s “Skynet” electronic surveillance system in major urban areas; putting GPS trackers in motor vehicles; facial recognition scanners at checkpoints; and installation of apps that wipe smartphones of so-called “subversive” material . Such tech-heavy endeavors have also been paralleled by an intensification of more manpower-centric measures of surveillance and policing including: implementation of “convenience police stations” in urban areas; deployment of thousands of CCP cadres into the countryside to “educate” the Uyghur population on government policies; and coordinated mass anti-terrorism “oath-taking rallies” by thousands of security personnel in major cities such as Urumqi, Kashgar, and Khotan. Here, promulgation of new legal restrictions on religious practice and use of “political education centers” to coerce Uyghurs displaying “deviant” behaviours have become the norm. From government officials describing Uyghur “extremism and terrorism” as a “tumor” to equating religious observance as an “illness” to be cured, the CCP’s discourse frames key elements of Uyghur identity as pathologies to be eradicated. Reporting by international media and human rights NGOs shows that the CCP’s idea of “curing” these supposed pathologies is a program of mass internment with at least 1 million Uyghurs interned in “re-education” centers based, in part, on data harvested through this architecture of surveillance. As China has intensified this repression in Xinjiang so too has it intensified its externally-oriented IW strategy with respect to Xinjiang and Uyghur terrorism. It has, for example, embedded “counterterrorism” as a central agenda of the Shanghai Cooperation Organization (SCO) in the years since the 9/11 attacks, with the organization focused to a great extent on regular joint counterterrorism exercises, judicial cooperation on the extradition of suspected “terrorists,” and information sharing. Beijing has also engaged in public opinion warfare through consistent publication in state media such as China Daily, Xinhua, and Global Times of op-eds and reporting that explicitly attack Western media coverage of violence in Xinjiang. After the March 2014 Kunming terrorist attack, for instance, China Daily published an trenchant op-ed decrying the West’s “double standards” on terrorism. 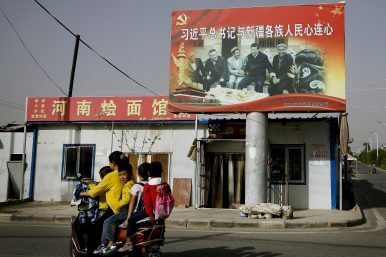 As information about China’s mass “re-education camps” has reached international audiences, Beijing has also begun to deploy a number of different narratives on these media platforms to combat what it views as “disinformation” about the situation in Xinjiang. The pervasive internal surveillance apparatus within Xinjiang and the externally-oriented IW strategies engaged in by Beijing are not simply concerned with physically controlling space and individual citizens. Rather, they are also designed, as Deputy Xinjiang CCP Secretary Zhu Halian remarked on February 17, 2017, to ensure that “Uyghur terrorists” will be “like a cornered beast” bereft of either practical or moral support. Here, China’s “re-education” camps emerge as a depressingly logical extension of this process. In the camps inmates are forced to sing patriotic songs, take part in self-criticism sessions, and sit through lectures on “Xi Jinping Thought,” Chinese language, Chinese law, and the dangers of Islam. The application of elements of China’s IW strategy in Xinjiang have thus served a preventive function through the targeting of religious and cultural manifestations of Uyghur distinctiveness that the CCP views as obstacles to “social stability.” This demonstrates that, for Beijing at least, IW is as usefully deployed in the service of domestic security as it is in pursuit of foreign policy objectives. Indeed, as Peter Mattis has noted, this is reflective of a broader issue vis-à-vis the CCP’s perception of security: that many of the threats to it “occur in the realm of ideas” that “cannot be defeated by kinetic means”. Dr. Michael Clarke is Associate Professor at the National Security College, Australian National University. He is the editor of Terrorism and Counter-Terrorism in China: Domestic and Foreign Policy Dimensions (Oxford University Press/Hurst Publishers, 2018).